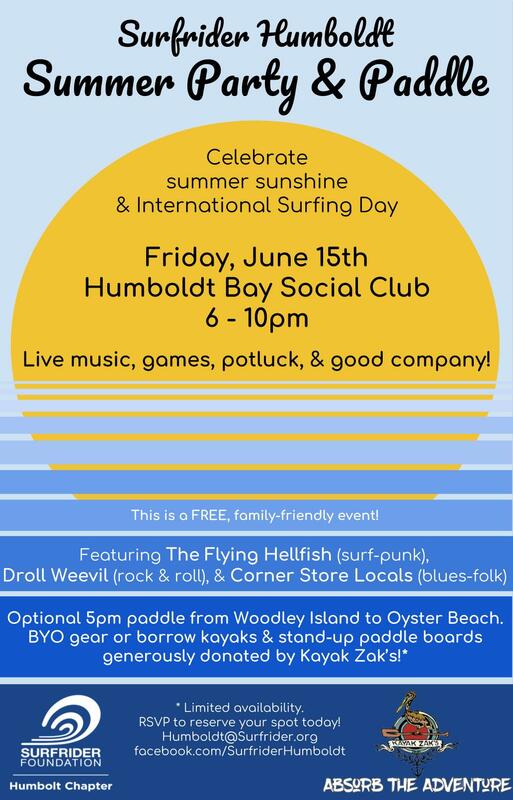 Come celebrate summer and International Surfing Day at the Humboldt Bay Social Club! Potluck, live music, games, raffles, and good company! Attendance is FREE! Bring your own burgers, veggies, hot dogs or favorite dishes to throw on the Social Club’s outdoor grills. We will have charcoal to share! Optional relaxed paddle from Woodley Island to Oyster Beach, where you’re just a short walk away from the party at the Humboldt Bay Social Club! In need of a new hoodie or t-Shirt? Our merchandise table will be restocked with fresh Surfrider gear. Stoked to see you fellow ocean lovers there! Local Surf & Skate Giveaway! You could win a brand new, locally shaped surfboard from Flying Fish Boardworks or a shiny, new skateboard from AMPT Skate Shop. Both will be raffled off at the event so come on out and buy some raffle tickets to support your local Surfrider chapter. Park in the H and I parking lot – this is the first lot on your left as you pass the NOAA station entering Woodley Island. Here, you will find Byron, our Paddle Organizer. DETAILS: This paddle is estimated to take 45min-1 hour. We will end at the Humboldt Bay Social Club. Surfrider volunteers will be at the social club, ready to shuttle paddlers back to their cars on Woodley Island. GEAR: This was a BYOG (Bring Your Own Gear) event, but Kayak Zak’s has now generously donated paddle boards and kayaks! There is limited availability so you must RSVP via Email (Humboldt@surfrider.org) or Facebook to reserve your complimentary gear. Also, please feel free visit our Facebook event page and post a comment if you have an extra kayak or stand up paddle board to share for the day, or are in need of one! The Humboldt Bay Social Club is happy to have everyone bring food to the event, but NOT booze. The Lobby Bar will be serving beer, wine, and cocktails for purchase. 10% of proceeds benefit the Surfrider Foundation and our Water Quality Conference this fall. If you are bringing a personal picnic, or food to grill and share, you might also want to think about bringing reusable utensils, plates, etc. We’d like to make this a zero waste event.